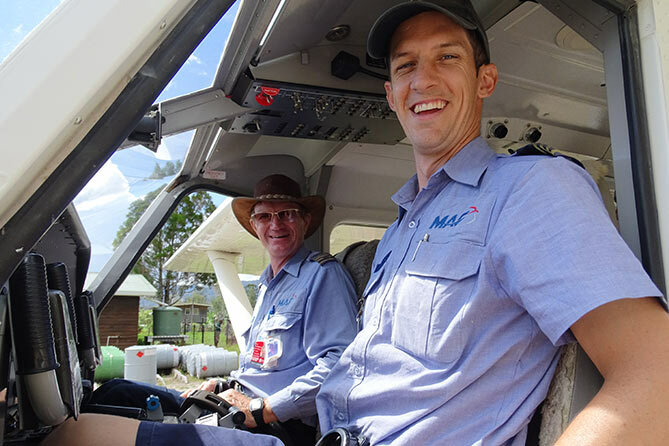 MAF plays an instrumental role in connecting communities. The shadows are long at this time of the day as the sun is about to set behind the rain clouds and the mountains in the Telefomin valley. The light is fading away. Darkness will take over quickly. But Deo is pushing hard and is totally focused to get this new antenna mast straight and secured by the end of the day. He has been up and running since the early morning hours. 7am was check-in at the Mt Hagen MAF base for his flight out West to Telefomin. Because of early morning fog at Mt Hagen and bad weather reports, one landing on the way and one diverted because of strong winds, he eventually got to Telefomin by lunch time. He was met by some staff from the Telefomin District Health Department and not long after that he was seen up on the roof of the Telefomin hospital, inspecting their old antenna and wiring. The decision was made quickly. This antenna had seen its best days and will need to be replaced with a new one. With some willing volunteers, two Community Health Worker students, one of their teachers, a nurse and the hospital’s cleaner, the task for the day was set – remove the old antenna mast off the roof and install the new one. 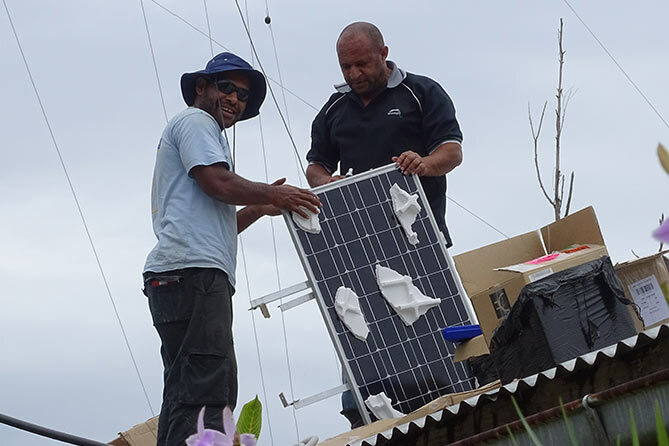 Everyone lent a hand and followed Deo’s instructions: measuring and cutting all the wires to the appropriate length, twisting them around some connecting insulators, carrying the equipment and tools up the roof, dismounting and releasing the old mast down to the ground, uninstall the old solar panel and all the wiring. It was all great team work and for the volunteers lots to learn. It became clear that the new mast could not be mounted where the old one was. The fittings just wouldn’t fit and with the strong winds that blow through the valley, the risk would be too high that the mast would be ripped off. Deo found a safe place between the old and new hospital buildings to mount the 12 meter mast into the ground. God was good and kept the rain away all day apart from a few rain drops here and there. It only started pouring after dark. The next morning Deo finished up the previous day’s work, installing the new solar panel on the roof, the HF antenna mast, and its transceiver at the hospital’s outpatient clinic. Then he started his next project, installing another HF antenna for the District’s Health Office. It took Deo two days to accomplish the two HF installations at Telefomin, working from sunrise to sunset. 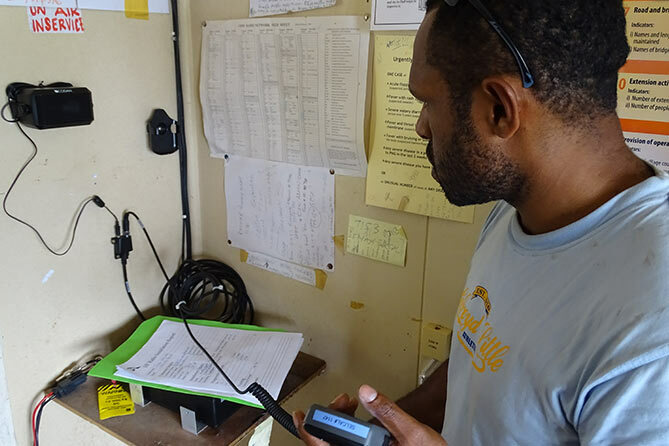 Friday afternoon came the thrilling moment, to transmit the radio data to CRMF’s HQ in Goroka to verify if the new radios were installed properly. 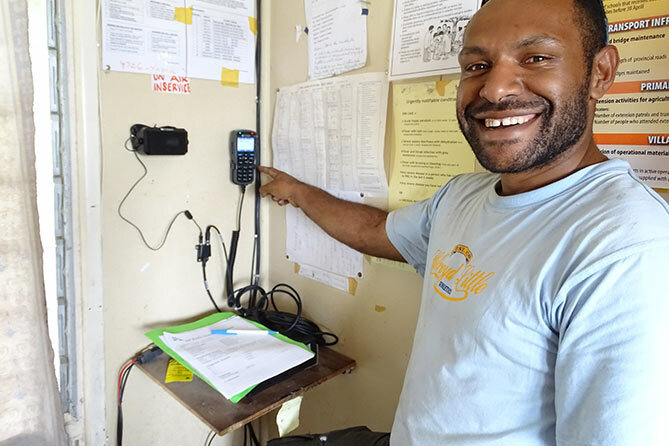 Lukas Schadegg, the Radio Technician and Workshop Manager at Goroka, concluded his test report with a “great job and well done!“ to the relief and joy of Deo. And there goes Deo, boarding another flight with MAF. 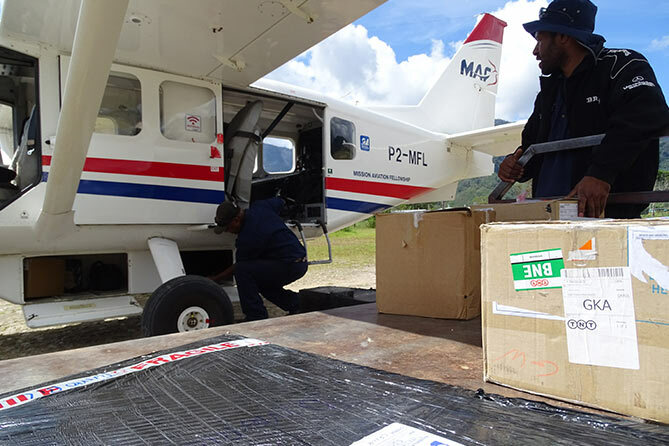 Leaving Telefomin to fly to Tumolbil, to install another HF antenna for the local health post. This community which is squeezed into a narrow valley close to the Indonesian boarder will now have a life saving connection to the outside world, linking it with the district’s main health facility as well as to our MAF radio network.